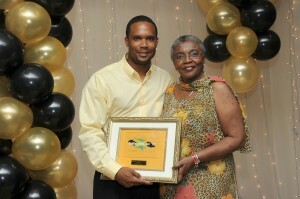 The Hibbert Heritage Award is the highest award that can be given to any single individual in the family. The purpose of this award is to highlight the one person in the family who has contributed most to the preservation of the family name of honor, character, and integrity and has provided opportunities for all of us to share in building pride within our family and our race. She was the fourth and last child for her mother Lucille Ioney Hibbert. She is a mother, grandmother, aunt, leader, and public servant. She has represented our family on an international level and her work and tenure as a public servant has taken her to countries including Jamaican Embassies in Bonn, (Germany) Brussels, (Belgium), and Geneva, (Switzerland) and to work for short periods at the Jamaican High Commission in London. When we started the family tree we designed it on paper and it was written as a two dimensional document. But the tree needed life. It needed color, depth, texture, and being. With her memory and love of storytelling, the Family Tree came to life and became a three dimensional entity. We all recall how we listened intently at the 2005 reunion to her representation of life back in the day and waited anxiously to see if she was going to call our name or make reference to us in her presentation. Her presence here represents what we all know and believe, that we need one generation to raise the generation behind them and that we have a responsibility to lead, teach, and uplift each other. With love, pride and my deepest appreciation for your contributions to what we have accomplished with the family legacy we honor you Auntie Barbara James.